This past Monday my son wasn't looking great. He sat at the table, staring at eggs he would normally devour with a dour expression and a slight tremble to his voice. When he went into his room to get dressed, everything that he's ever eaten in his life flowed forth from out of his face and onto the floor. So. Much. Puke. I also noticed he had a low fever, about 100 degrees Fahrenheit. I called the doctor and got him in. The diagnosis? Stomach flu. But, what's the difference between the stomach flu and the seasonal flu? This season is trickier than in previous seasons as the specific A virus for this year's flu is sometimes accompanied by vomiting, which is also a symptom of the stomach flu, noted Dr. Joshua Kosowsky, vice chair and clinical director of Brigham and Women’s Hospital, in an interview with Boston.com. Generally speaking, there are a few main differences between the two viruses. The stomach flu, like norovirus, does not have an upper respiratory component like seasonal influenza. It's marked by severe gastric upset — vomiting, diarrhea, stomach cramping, and nausea. It can also cause fever, chills, and aches, according to the National Institutes of Health (NIH). Influenza, on the other hand, causes terrible body aches, lethargy, cough, fever, headache, and a sore throat, the NIH noted. While there are myriad complications possible from influenza, the main complication for the stomach flu is dehydration. 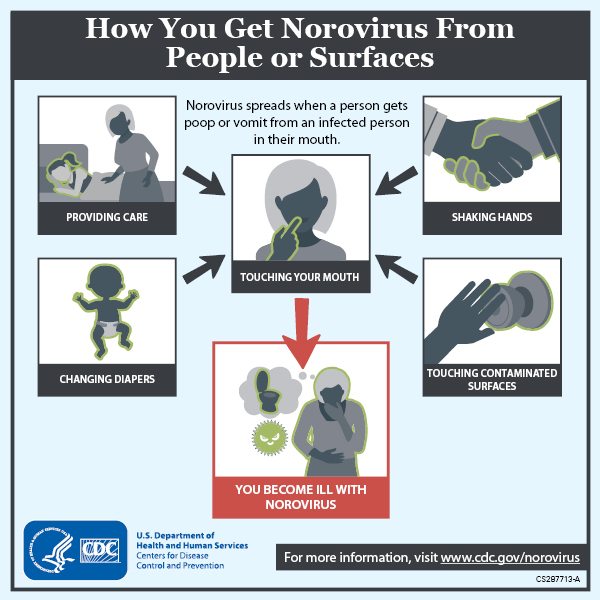 The manner in which norovirus is transmitted is the stuff of nightmares, according to the Centers for Disease Control and Prevention (CDC). The seasonal flu seems tame in comparison. 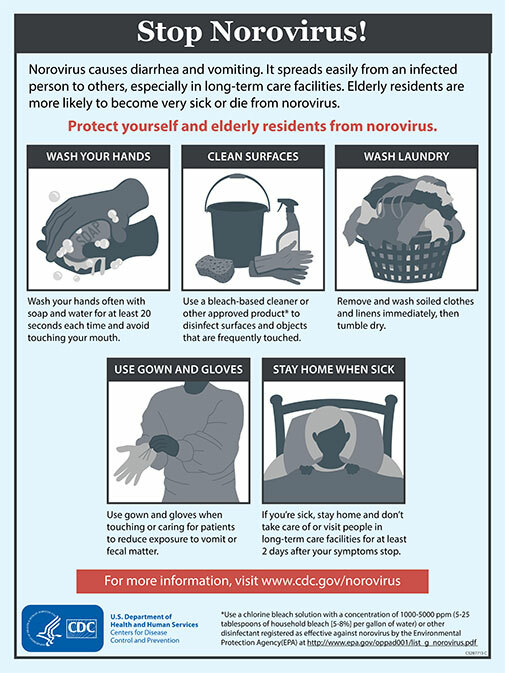 Norovirus is spread by contact with people or surfaces that are contaminated with feces or vomit. You read that right, and it's just as gross as you think. It's also incredibly easy to get. Consider the public restroom. How many of us blithely wash our hands and then turn off the tap and touch the door handle with our bare hands, still considering them clean? Unless someone magically washes their hands before they touch the faucet, it's contaminated immediately. When you touch it to turn it off, you're contaminated. You then contaminate everything else you touch — with poop germs. Influenza is a droplet based transmission, according to the CDC. This means a cough or a sneeze or talking can carry the virus to surfaces or directly to you. Somehow, that seems far more benign than being Poopy HandsMcGoo. While no one wants to be coughed on, we all talk to one another, and there's a risk when it's done in close quarters with someone who may have the flu. What's the difference between the stomach flu and the seasonal flu beyond the initial symptom disparities? For one thing, noted the Winnebago County Health Department, the duration of the symptoms tend to be wildly different. The stomach flu lasts generally between 24 and 72 hours, and only remains contagious for a couple of days after you feel better. The seasonal flu typically knocks you on your bum for a week (or more), and not only are you contagious for days before you become symptomatic, it can take days in your system before you begin to become ill, noted the CDC. If you have a fever, call your doctor immediately. This is not something to trifle with. There is also still time to get a flu shot if you haven't already. Unfortunately, there is no vaccine for Norovirus, and the treatment options are limited. For influenza, there are antivirals that can help greatly if taken when you first become symptomatic, as per the CDC. For both the seasonal and stomach flu, the CDC recommends fluids, pain relievers, and a lot of rest. Also, wash your hands frequently with hot soapy water, and disinfect all surfaces of your home. Honestly, after dealing with Norovirus in my home for a few days, I can tell you that the urge to Lysol everything is strong. Don't deny yourself the satisfaction.